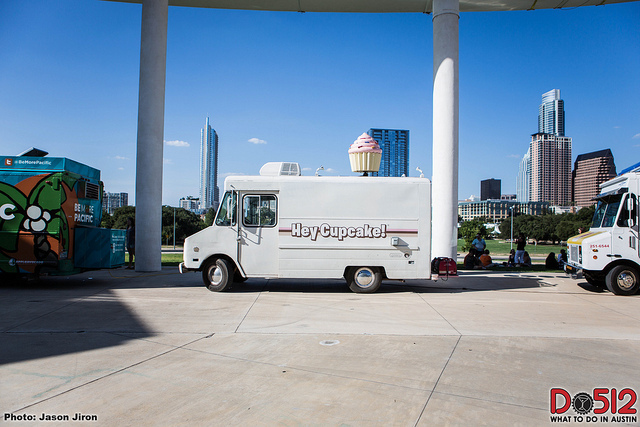 You are here: Home / Austin / It’s Food Truck Season! For me, the change in weather means I can finally hit some of my fave food trucks, and discover some new ones, without melting to a puddle under the extreme Austin sun, or killing the environment sitting in my running car, or huddling in the tiny patch of shade the truck awning may make if I’m lucky. It’s hard to keep up with all the new ones cropping up here and there, and personally of course I only really care about the ones with lots of worthy vegan options, or complete vegan ones like BBQ Revolution, Vegan Nom and Pulse Vegan. One trend i’m seeing is some really cool well organized food parks, with a nice variety of trucks, a cute name and sometimes even events. Oh and PARKING is a huge plus! Here are a few around town that you might want to partake while the weather is accomodating! This is in such a great location for so many areas – 360 between Barton Creek Mall and Westlake Drive and has a regular music calendar with great bands. Foodwise a lot of variety, I want to check out Royal Roots Juices for their organic fresh juice, Hand Helds has a vegan slider, and Cool Haus almost always has a vegan ice cream sandwich option! I’d love to know your picks for fave food trucks – please comment below!